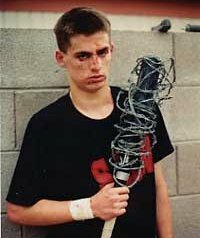 This electrifying undercover documentary explores the controversial phenomenon of backyard wrestling - where lightbulbs, fire, barbed wire, mousetraps, staple guns, thumbtacks, and glass are the weapons of choice. This undercover documentary is a real-life Fight Club, taking us deep into the controversial arena of backyard wrestling, where limits are constantly being tested and broken. The film follows several backyard wrestlers as they pursue their dreams of going pro. Frank and bloody - it's not for the squeamish - The Backyard is described as "a fascinating emotional roller coaster" by Film Threat, a documentary that "approaches the subject with genuine curiosity and a lack of judgment that is responded to by the participants with amazing candor and a complete lack of pretension or humility." A graduate of NYU, Paul Hough directed the TV series Reverse Angle, which was banned from the air.